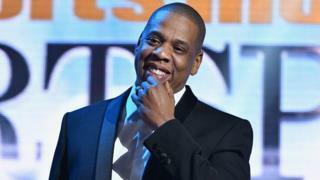 It's fair to say Jay Z is quite excited about being inducted into the Songwriters Hall of Fame in the US. It's seen as a huge honour within the music industry - and Jay Z is the first ever rapper to do be selected. How can we tell Jay Z is happy about it? He has tweeted. Which isn't something he does very often. "This is a win for us. I remember when rap was said to be a fad. We are now alongside some of the greatest writers in history," he said. Joining the hall of fame is a big deal - previous inductees include Marvin Gaye, Bob Dylan, Dolly Parton, Bruce Springsteen and Michael Jackson. It tops off a pretty decent month for Jay Z - which saw him and his wife Beyonce announce they were expecting twins. Jay Z will be inducted as part of the hall's class of 2017 alongside Max Martin, who has written songs for Taylor Swift, Katy Perry and Ariana Grande. This explains why Jay Z is being inducted now - as he recently passed the 20th anniversary of his debut album Reasonable Doubt, released in 1996. Chic guitarist Nile Rodgers, who was one of last year's inductees, said Jay Z had "changed the way we listen to music". Madonna and George Michael were both nominated this year as well but weren't chosen this time.